Started the day right with a morning strength training session. Did 2 exercises for each muscle group (chest, shoulders, and triceps), and then I threw in some abs at the end. I did follow the suggested reps on bodybuilding.com (15, 12, 10, 8), aiming for muscle exhaustion each time. It took about 45 minutes. Also did a 5-minute warm-up on the elliptical and a small bit of stretching after. Note to self: research stretching each of the muscle groups because I don’t think what I’m doing is enough. 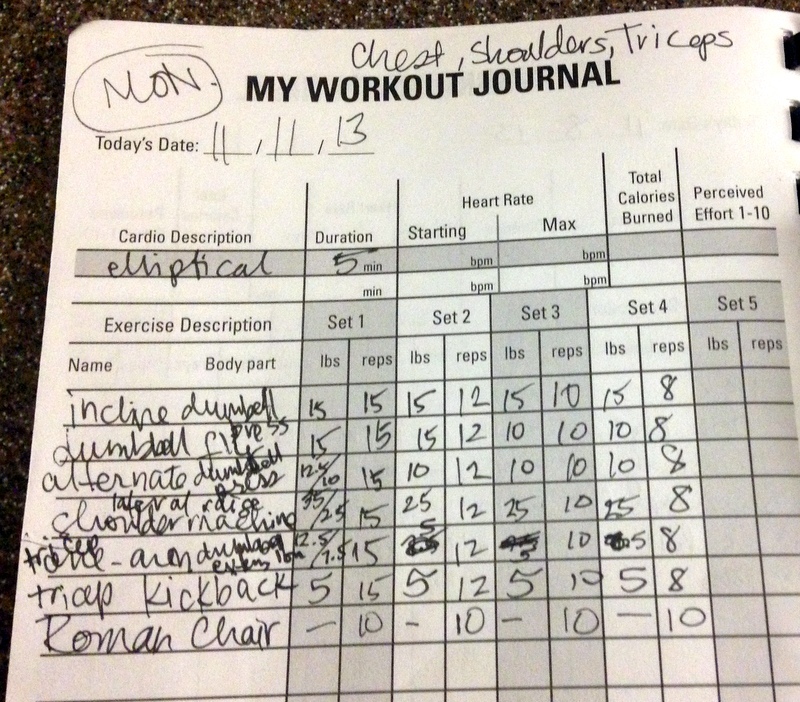 Sorry my writing is so messy – I usually fill this out while on the elliptical for warm-up. Although I’m SUPER tired today, I feel pretty motivated that I’ve set a goal and am taking solid steps towards it. Over the weekend, I contacted a NASM Education Advisor about the CPT certification, and signed up! I started doing the online coursework, and am just waiting on my textbook to really get into learning and studying the material. I bought the base package, and got a discount by mentioning another PT’s blog. Leave a comment if you’re curious who/how. The online coursework seems pretty good so far. This entry was posted on November 11, 2013 by healthyfoodie and tagged eating plan, exercise, food log, nutrition, personal trainer, strength training, workout log.